I've never played any Duke Nukem. I've never even watched anyone else play Duke Nukem, which is where my familiarity with Half-Life and Rainbow Six: Rogue Spear comes from. But none of that matters when it comes to the PigCop. This advanced mutant bacon lives only to serve and protect the other Aliens. 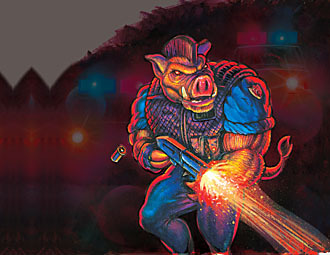 The dreaded PigCops are indeed faithful servants and ruthless killers. 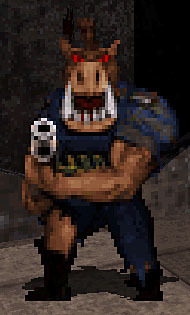 The PigCops are probably the most recognizable monsters in the Duke Nukem series, and that's no small feat considering they have to compete against robotic Hitler [No, you're thinking of Wolfenstein 3D --ed. ], Arachnotrons [Doom --ed. ], Shamblers [Quake --ed.] and the Pfhor [That's... did you just make a Marathon reference? Nerd. --ed.]. They've appeared in every game since Duke Nukem 3D... which isn't really saying much, since that game came out in 1996 and the sequel came out in 2011, but Duke Nukem followed the Street Fighter II model, releasing a lot of followups that were just the same game given a superflous title: instead of suffixes like "Alpha Hyper Turbo Championship Edition," Duke got "Life's a Beach" and "Nuclear Winter." And every one of those not-a-sequels had its own PigCops in different outfits. This is the classic PigCop, though, wearing his blue uniform. The figure was sculpted by Darryl Finney (with added details by Jay and Chris Borman, the Plan-B guys), and he's looking great. He's very muscular, suiting the Duke Nukem style, but a lot of his bulk goes into making him wide, not tall. 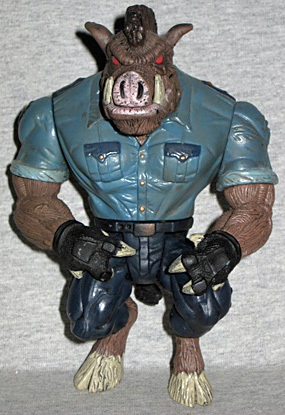 His shirt and pants are stretched tightly over the body beneath them, making it look like he was a real policeman who was transformed into a pig, not an alien pig-man who was put into normal clothes. 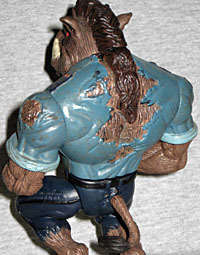 The back of his shirt is split open, making room for his mane, and there's a hole torn in one shoulder, as if a patch on the sleeve were ripped away. The sleeves are rolled up above the elbow, there are visible seams, stress markss around the buttons and fully detailed pockets. He's even wearing little black gloves tailor-made for his weird hands. The PigCop's exposed body is furry, but it's not really sculpted as fur: it's covered with deep, sculpted lines, but if we weren't already thinking of him as being a furry animal they might not read right - they could easily just be muscle striations. There are wrinkles on his lower lip that makes it look chapped, and his snout and tongue are textured appropriately. For a bit of character, he has a scar over one eye - definitely not something that would have been visible on the old game renders. The figure stands 5⅜" tall, and has average articulation for a 1997 release: T-crotch, swivel waist, wrists, biceps, shoulders and neck, and a hinged jaw. Okay, the jaw is unusual, but none of the rest is too surprising. The right leg on mine was too bent to allow him to stand upright, but I was able to boil and stretch it very easily. The head doesn't turn very far, due to the shape of his body. His accessories are really neat. First, he has a removable bulletproof vest. 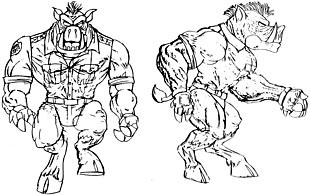 It was a standard feature on the videogame PigCops, so it could have just been sculpted on the figure: making it a separate piece shows how cool ReSaurus wanted to be. There are several spots where you can see it's already been struck by bullets, revealing the silver armor underneath the detailed surface. 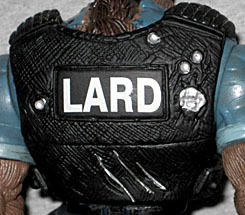 Since Duke Nukem 3D starts in Hollywood, it makes sense that the PigCops would play off the L.A.P.D. - thus the L.A.R.D. logo on his vest. Funny! Of course, the uniform beneath isn't quite right; after all, we're all entirely familiar with what an LAPD uniform looks like, and it's not two-tone. Beyond that we get the PigCop's weapon of choice: a shotgun. Or a ShotGun, as the packaging inexplicably calls it. It's a very cool piece, sculpted with four shells on one side and a real sliding forestock. Next we have a nightstick that's had a knife tied to the end, and finally a gasmask designed to accommodate his snout. 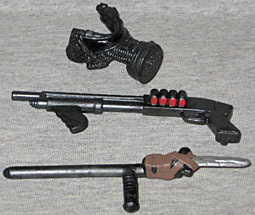 There are pegs on the weapons that match up to holes in his hands, allowing him to hold them securely, but the gasmask is kept in place by nothing more than a perfect sculpt. The art on the packaging wasn't just a photo of the toy, or a render from the game (because back then, that would have been ugly as %^*#) - instead, they went old-school and opted for fully painted images of the characters. That wasn't provided by 3D Realms (the licensor), either: ReSaurus VP Mike Compton did the art for Battlelord, but the others were done by Tom Biondolillo, a friend of Ken Lilly's from back in college. And thanks to Ken for this un-cropped shot of the art, too! I don't have a ton of ReSaurus figures, but PigCop is easily my favorite. I still remember when and where I bought him, even 15 years later. He's outdated by today's standards, but he's still pretty good. 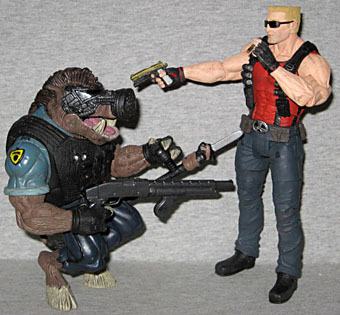 I hold out hope that NECA will manage to make a PigCop of their own, one capable of standing next to their Duke Nukem, but until that day comes, the ReSaurus version is wonderful to have.